Stage 1-4: Grind, you can use actives to speed up but make sure that everything is ready before moving on to the boss. Stage 5: Full burst, remember to turn back any enchantress effects (Dark Devil, Novalis). Use Endor and spin well or you're dead. For my farming team I'm bringing pr faugn instead of the extra booster. Only needing to do 8 combos instead of 10 is a little less stressful. R5: Bankai + PR Endor. The bankai board is pretty much a simple 8 combos board with the standard 3-3 horizontal dissolve. The team i use is kinda the safe version. Wawel is for emergency leeching and increase HP. If want to aim for min round, your craft need to be the one that cut CD for at least Endor and possibly Yocto which means 2 or more Dark/Human CD - 2 and need to be able to equip by your leader. 2 attributes 12 turns clear. R3: Waste 1 turn just to remove electrify runes (Stall for yog). Then normal spin both HP. R4: Off enchantress, use Yog + craft. R5: Yog and on enchantress, then starter for 10 combos. Remember to aim center and you only have 10 seconds with starter. R1. Meh.. Verd stack and grind. Make sure all actives are up before killing her. Grind thru him. Make small bursts in between to speed up the process. 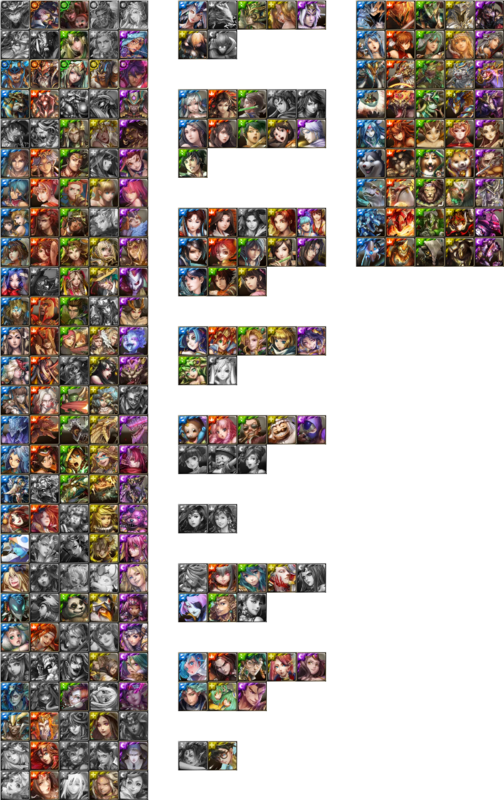 Save wukong for next stage. Final burst with hatter activated to avoid skill-lock in next round. R5. Phase1: Wukong defence-break to kill the high-defence part(baby head) and proceed to phase 2. Phase2: Verd stack & grind. Full burst if you have time-tunnel active. Else, prepare 8 combos on the board before bursting. Use pr RGB hyakii + rgb starter super safe. 5. If you not sure to get 10 combo initial, aim for right part. After right part killed you cant die. Prepared for next burst this time only 8 combo should be easy. Aim for center part. Shuten, yog, starter, seth, nezha/any non god card, shuten. Tengu, belial/mufasa, nidog, blair/dbk/non god card, starter, tengu. Done all achievement with 2 Satan team variation. R1: Store 2 rounds here and let it hit you. Try to heal if you can take another hit continue storing if not just kill. R2: Try to store and kill them only when they are at CD1. R3: Kill asap dangerous round. R4: Use 1 Satan, spin your best + DC. Convert if needeed. R5: Just aim the center and burst with everything.